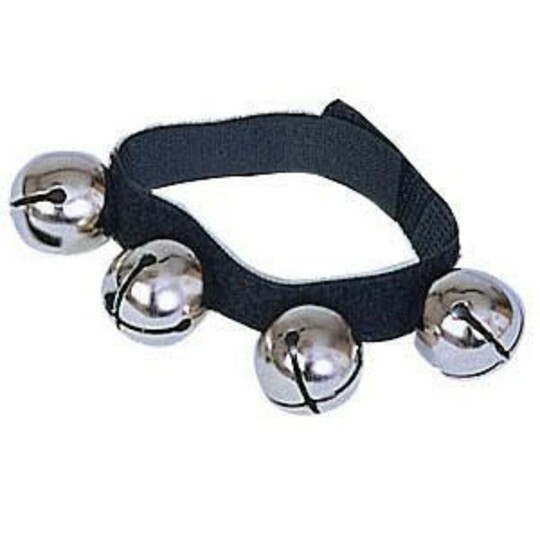 9"L adjustable plastic strap includes four 1" nickel-plated jingle bells. Fun wrist or ankle bracelet. Adjustable plastic strap includes four 1" nickel-plated jingle bells. Assorted colors. We use these bells as part of our homeschool program. They are great for following the beat. I use these jingle bell bracelets in my PE classes while we perform Christmas routines. Sometimes the students wear them as we run around the gym. These bracelets are high quality and sound great. I ordered a second set this year because I needed additional bracelets. I highly recomment this product. Just as expected bells can be worn on wrist. Used in a holiday game called where's the bell. Perfect size to hand off to the next student in a circle and then hide. The Velcro closure is an added bonus!